Hey, hey, wait a minute Mr. Postman: Forever 21 has teamed up with the United States Postal Service — yes, the federal agency just barely a notch above the DMV where you wait on long lines to buy stamps — for a fashion collaboration that’s truly the total package. 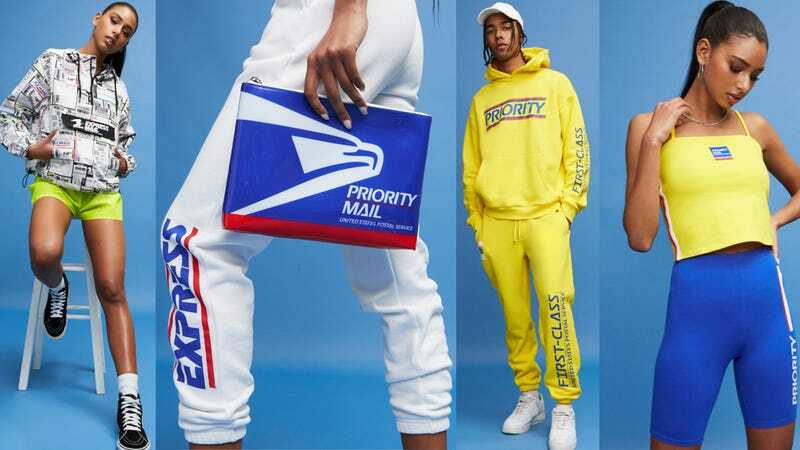 The Forever 21 x USPS collection’s aesthetic is not so much “mailman chic,” (unless, of course, you’ve spotted your mail carrier sporting a tiny tube top with the word Priority printed across the chest!) as it is “dress up like a literal package.” But like, a fashionable package. Eternal 21-year-olds can shop everything from a shipping label-emblazoned, reflective orange jacket, to white Express joggers, to a now sold-out USPS envelope zippered clutch, and it should be your priority to shop this collection soon, too, lest any more of these first-class items run out of stock. All I’m trying to say is, the Forever 21 x USPS collab delivers. Anyway, it has my stamp of approval.